the very first incarnation of my baby beau pattern, originally blogged here. raveled here. size 6 months, on my 3 month old. now, the reason i’m talking about this sweater again is not to just post the cute picture ;) in fact i am very pleased with this pattern now that i have a babe to put it on. let me tell you why. 1) love the wide neck, especially on the little little ones since their neck is often buried. 2) straight arms! i can easily put long sleeves on under it and it’s easy to get on. a few decreases would be okay. 3) and lastly, i’m pleased because this little sweater is even cuter when being modeled! yay for modeled knits. and my advice to all of you, always make baby clothes bigger than you think. seriously. things only kind of need to fit kiddos, they even look cute when a bit big. that and all babies are different sizes and shapes… like this one who is 95th percentile for height and 50th for weight. you always hear it said, but i had no idea until i had this one. from squidgy to walking in 1 year! wow. 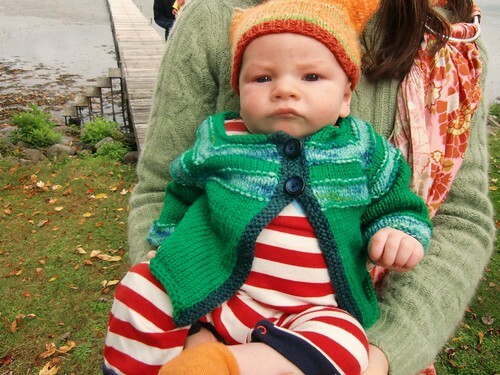 This entry was posted in baby, cosyknitsliterally, hats, knitting, patterns, sweaters by cosymakes. Bookmark the permalink. Now I really need to get on making one for my little one. I realized today he doesn’t have any sweaters that fit anymore (not that he needed the ones which fit earlier). I’ll go digging in the stash tonight! aww, and he looks so adorable in that sweater! Awww! Sounds like our kiddos are body doubles! Mine was always skinny but so long that we often had to go up a size before she filled out the last one.